It is working properly at submission time, but if I am editing one of the submission with payment is made On line with CB then the "paiement" field is emptied out. To have it back to "Oui" I need to set the field "Payé" to "Oui"
I cannot find the reason of this curious functioning. 2. Navigate to the Submissions page and click "Edit". 3. 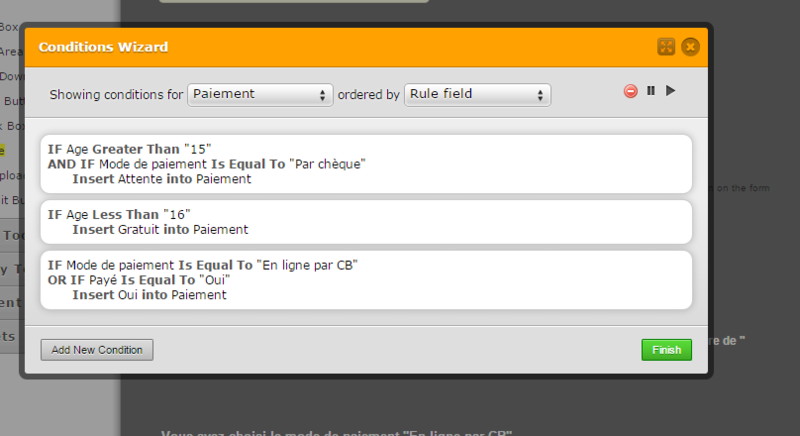 In the submission, if "On line with CB" is selected the "paiement" field is empty? 4. To set it back you need to select the "Paye" to "Oui". I cloned your form and made a test submission, and I edit it. But, I wasn't able to replicate the problem. The "paiement" is not empty in my submission. I assume you have already resolved the problem? If not, please do check your conditional logic again and see if there are any conflicts on it. Do let us know if you are still having problems on this. I agree with you at submission time the field is properly set. But when you edit the record ans say change the first name and save the change then the "Paiement" field is emptied out unless you play again with "Mode de Paiement" or "Payé" which we shouldn't have to. I was able to replicate the problem. I'm currently investigating it and doing some further testing, I will get back to you as soon as I have a compilation of my results, there might be a need to escalate this to our developers. I believe this is related to a conditional logic, here's a conflict. What if the Age is greater that "15" and "Mode of Paiement" is Not "Par Cheque"? it will then give it blank without considering the 3rd condition. You can try cloning my form here: http://form.jotformpro.com/form/51901339282959. You can test it in your end. That reason is that when in edit mode, the priority condition is the one with the "Age" field. 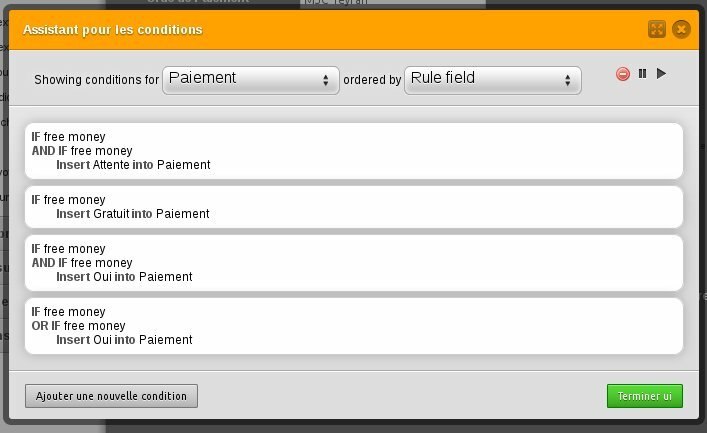 The 3rd condition does not have an "Age" field causing a conditional conflict which in return shows a blank field. I hope that helps. You just need to take into consideration all the fields you are using in a specific field with condition. 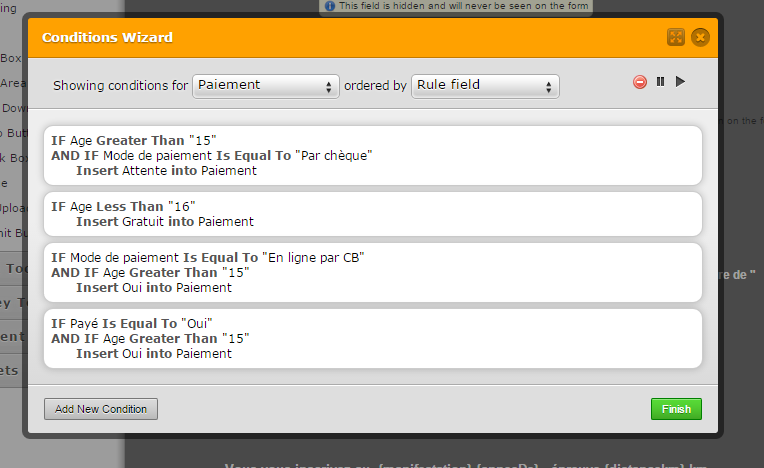 In this case, the "Paiement" field is depending on the "Age", "Paye" and "Mode de Paiement". Many thanks for your help, it's working now with your solution. I take this opportunity to show you that my display of conditions is far less practical than yours as I need to open each condition to see the details of it whereas it seems that on your side you are able to see all the detail of the conditions in one shot. Do you have any clue for this ? In my colleague's name, you are welcome Georges. I am glad to hear that the issue was resolved. Now since your other issue with conditions is not related to this issue, I have moved this to a new thread so that we can properly assist you with it, as that is not how it should look. This is the link to your new thread: http://www.jotform.com/answers/607988 and we will be replying to it shortly.